Dollop the yogurt over the vegetables, then gently spread with a rubber spatula. Sprinkle the yogurt with salt (optional) and paprika. 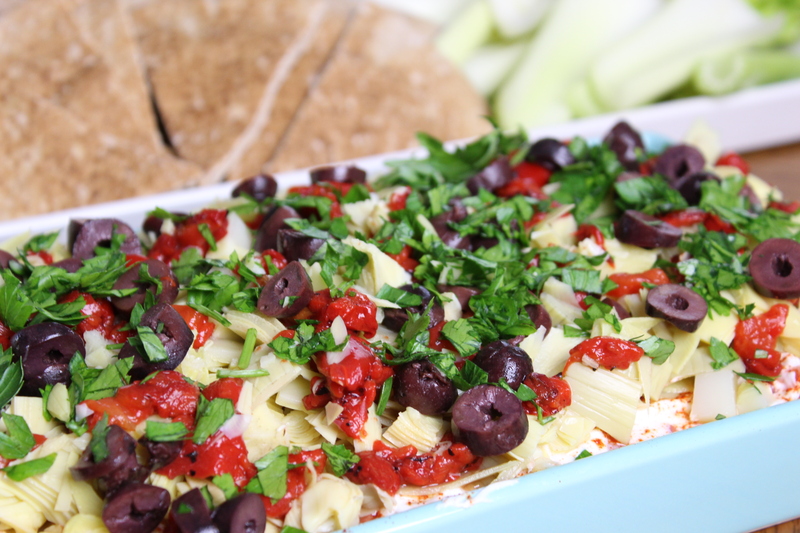 On top of the yogurt, layer the artichoke heart, roasted red peppers, peppercini’s and feta cheese. Sprinkle the parsley over top. Serve with fresh vegetables (like celery, carrots, and cucumbers), pita chips, whole-wheat pita bread, or crackers. This recipe is so perfect, I never change a thing when I make it (I have added peppercini’s because my husband LOVES them). Try making your own hummus, it’s waaaay cheaper and you are able to control the quality of ingredients! *If you are diabetic, I suggest eating this dip with veggies instead of the crackers, pita chips, and pita bread.